RBTH presents a selection of views from leading Russian media on international events, featuring a report on French President Francois Hollande’s plan to discuss the delivery of the Mistral helicopter carriers with Russian President Vladimir Putin, an update on the bans on Russian participation at the Parliamentary Assembly of the Council of Europe, and news of plans by Sunni Arab states to counter the missile systems being supplied to Iran by Russia. 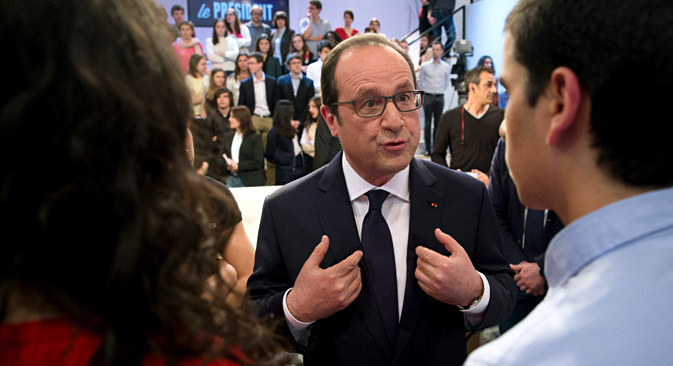 Talking to the Canal+ TV channel, French President Francois Hollande said that, together with Russia, he was looking for “a way out of the crisis” with the ill-fated Mistral helicopter carriers, reports the Moskovsky Komsomolets daily tabloid. Hollande said that he would be meeting Russian President Vladimir Putin in Yerevan on April 24, at a memorial ceremony marking the centenary of the Armenian genocide. During the meeting, writes the newspaper, the French leader intends to discuss with Putin ways of resolving the situation with the Mistrals, whose delivery to Russia was suspended due to the Ukraine crisis. The 1.2-billion-euro contract for the delivery of two Mistral helicopter carriers was signed in 2011. According to media reports, in the event of non-delivery, penalties could reach 3 billion euros. At the same time, during his annual question-and-answer session with the nation on April 16, Vladimir Putin said that Russia did not intend to demand penalties from France for failure to deliver the helicopter carriers. According to Putin, France’s refusal to deliver the Mistrals to Russia was “a bad sign,” but it would have no impact on the country’s defense capability, Moskovsky Komsomolets concludes. The Kommersant business daily previews the upcoming spring session of the Parliamentary Assembly of the Council of Europe (PACE) in Strasbourg. The session was expected to discuss the issue of revising sanctions against the Russian delegation. However, the head of the assembly’s Monitoring Committee Stefan Schennach told Kommersant that this topic is unlikely to feature in this session’s agenda. “My proposal not to add this issue to the agenda of the session was unanimously supported by the members of the Monitoring Committee. The discussion will take place in June,” he said. Kommersant reminds its readers that members of the Russian delegation at PACE have been stripped of the right to vote, to work in PACE governing bodies and to deliver speeches. For its part, Russia has suspended its work at PACE till the end of the year. Kommersant sources at PACE point out that it is unlikely that the powers of the Russian delegation will be restored before then. The lifting of sanctions is conditional on the Russian side implementing a resolution consisting of some 20 points, including ending the annexation of Crimea, no longer supporting participants in military activity in the Donbass region of eastern Ukraine and releasing Ukrainian pilot Nadezhda Savchenko from prison. In late March, the PACE Monitoring Committee ruled that not a single point of the resolution had been carried out and there were no grounds for revising sanctions against Russia, the paper adds. The centrist newspaper Nezavisimaya Gazeta reports that growing regional conflicts, the confrontation in Yemen and plans for the supply of Russian S-300 surface-to-air missile systems to Iran are prompting the United States’ allies in the Middle East to increase their arms imports. Nezavisimaya Gazeta points out that previously Washington’s strategic aim was to ensure Israel’s military superiority in the region, hence the American government’s tough restrictions on arms supplies to Middle East countries. The paper predicts that the situation may now change: Washington is expecting a request from the air forces of Sunni Arab states for the supply of advanced fifth-generation F-35 Lightning II bombers, which in theory could help bomb Iranian nuclear facilities despite the use of Russian S-300 surface-to-air missile systems. So far, the U.S. has supplied these aircraft only to its allies in Europe and Asia, the paper adds. “At the moment, no-one can say whether F-35 fighter-bombers will be able to counter S-300 missile systems, should the latter be supplied and deployed,” deputy head of the Strategy and Technology Analysis Center Konstantin Makievnko told Nezavisimaya Gazeta, commenting on a possible confrontation scenario. Furthermore, he went on to add, if Iran decides to respond to the supply of F-35 fighters to Arab states, the logical step for it to take would be to purchase fighter aircraft from Russia.